A compilation of various tracks from various sources and I don’t think it was ever released commercially. But, quite a few of the songs has been released on Orphans and that’s why I’m inclined to call it a playlist rather than a bootleg. 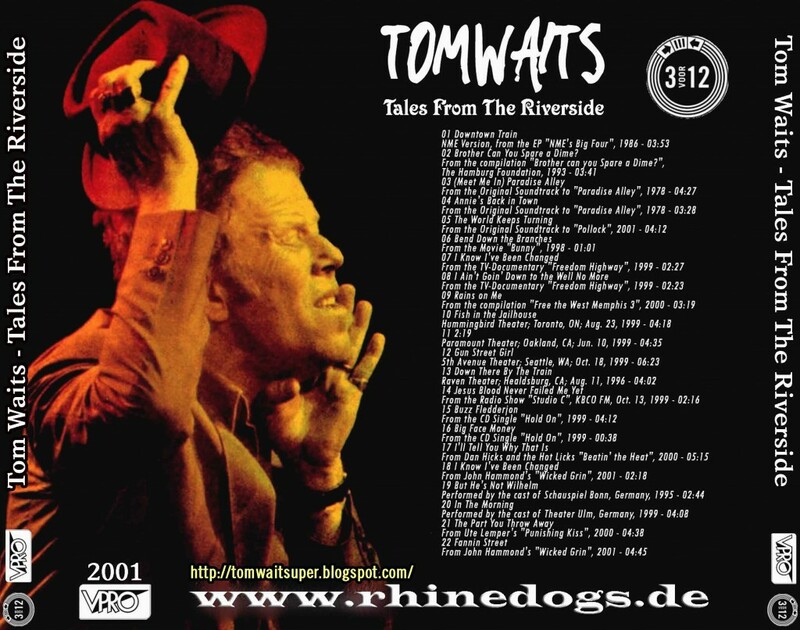 Anyway, I think it is a good compilation and one of the most played Tom Waits playlists in my home. The track listing is taken right from the original artwork scans from the people at tomwaitsuper.blogspot.com (now sadly closed), with a few additions from myself. 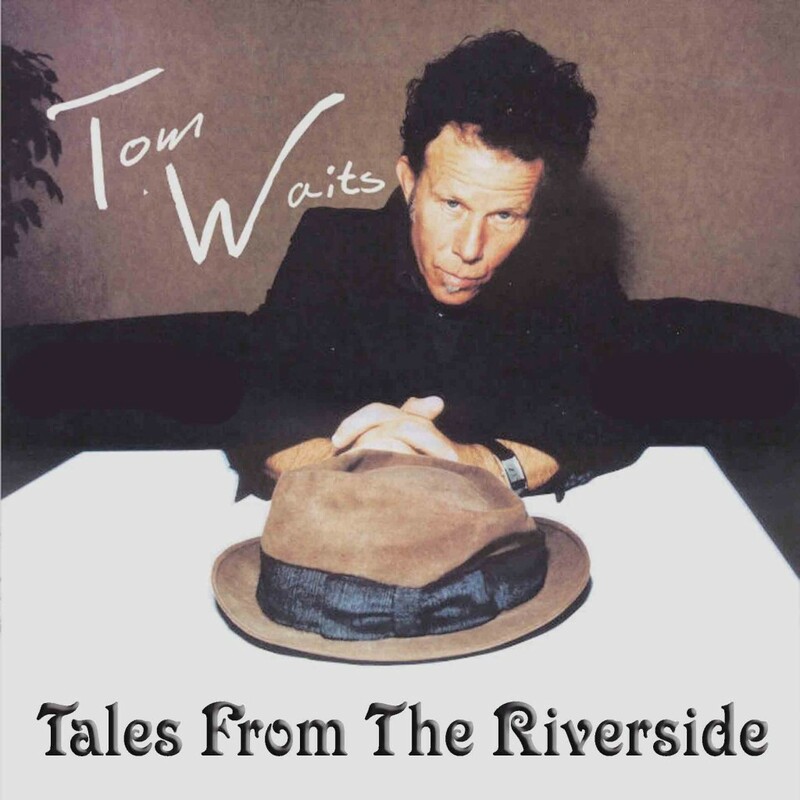 As we all know, the Tales From The Underground bootleg series is a great thing, for it features a huge collection of rare Tom Waits-songs that can’t be found on his official albums. Nevertheless, the folks who produced those bootlegs made some mistakes and forgot some great recordings. And there were a lot of new songs released after Tales From The Underground Volume 5 came out. This compilation is meant as an addition to that great set. It’s entitled Tales From the Riverside. The first four tracks are improvements of the Tales From The Underground bootlegs. Volume 1 claims to feature an “alternate master” of Downtown Train, but in fact it’s the same version as on Rain Dogs. So here you’ll get the real “alternate take”, it’s called Downtown Train (NME version) and was recorded from a promo EP that came with the New Musical Express on the 1st of February 1986. The following three tracks are already to be found on Tales From the Underground Volumes 3 and 4, but we weren’t satisfied with the sound quality of these tracks, which sound as if they were recorded from an old tape. We managed to get our hands on the original sources of these songs, that means the promo CD “Brother, Can You Spare A Dime?” from 1993 and the original soundtrack Paradise Alley from 1978, so that you’ll get the crystal clear original recordings of these songs with our compilation. 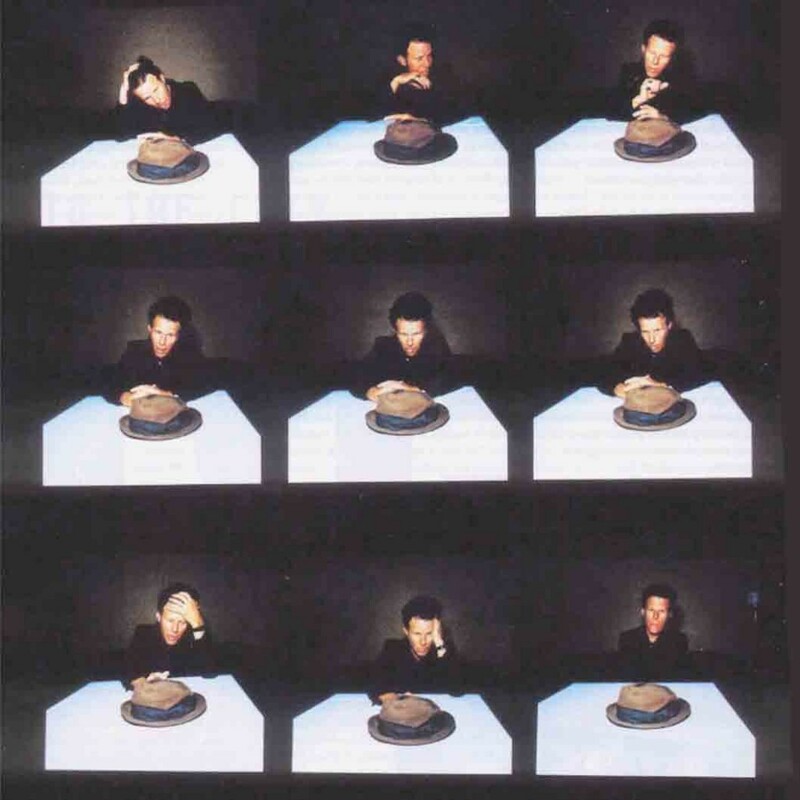 The World Keeps Turning is Tom’s brand new contribution to the soundtrack “Pollock”, which was released February 2001. The song Bend Down The Branches is taken from the short movie “Bunny”, 1998. Of course there’s no soundtrack album available and we had to record this track from video – and unfortunately the result is of very poor sound quality. Rains On Me is taken from the benefit album “Free The West Memphis 3”, 2000. It’s an alternate take of Tom’s duet with Chuck E. Weiss It Rains On me from Weiss’ album “Extremely Cool”, 1999. Fish In The Jailhouse and 2:19 seem to be Mule Variations outtakes. There aren’t any studio recordings of these songs available so far (at least by Tom), but Tom played these songs every now and then on the Get Behind The Mule Tour 1999, and we tried to pick out two really good sounding audience recordings. On the same tour Tom performed a new and absolutely fantastic version of Gun Street Girl in which he used Leadbelly’s I Ain’t Goin’ Down To The Well No More for the chorus. Down There By The Train was written for Johnny Cash, who recorded this song for his album “American Recordings” 1994. As fas as we know there’s only one rendition by Tom himself, from the Storming Heaven Benefit, Healdsburg, August 11, 1996. It seems to be impossible to find a really good recording of this historic moment, so that the sound quality of this track is rather poor. But – what a performance! The small excerpt from Jesus’ Blood Never Failed Me Yet was performed by Tom during the radio show “Studio C”, KBCO FM, October 13, 1999. Buzz Fledderjon and Big Face Money came as bonus tracks with the CD single “Hold On” 1999. The following two tracks are duets Tom recorded with other artists during the last year. I’ll Tell You Why That Is is taken from Dan Hick’s album “Beatin’ The Heat”, 2000, and I Know I’ve Been Changed was originally released on John Hammond’s album “Wicked Grin”, 2001. The last four tracks are songs that were never recorded by Tom himself (as far as we know). But He’s Not Wilhelm and In The Morning are two beautiful songs from the musical “The Black Rider”. You’ll find the full cast versions from two German productions on our compilation. The Part You Throw Away is taken from Ute Lemper’s album “Punishing Kiss”, 2000. Fannin Street was written by Tom and Kathleen for John Hammond and was originally released on Hammond’s album “Wicked Grin”, 2001.